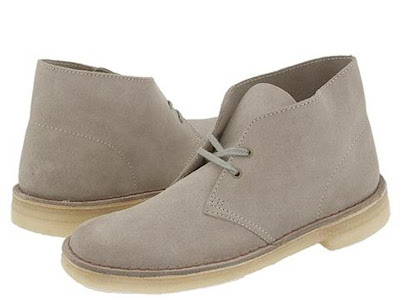 The Clarks Desert Boot is my go-to boot for any casual occasion. As noted on the Clarks Timeline, they were created in 1950 and "...inspired by the crepe-soled boots worn by British officers in World War II." They are generally suede or leather and feature the easily identifiable crepe sole. They come in a ton of different colors and patterns and, most recently, have been featured in several cross-collaborations from different designers and boutiques. From the beginning, you need to decide if you plan on keeping the boots in pristine condition (which requires careful care and maintenance) or if you will let them collect random scuffs and spots of dirt. To me, one of the best parts about the boots though is that they actually end up looking better the dirtier they get, each stain becoming a footnote referencing a previous day or night of fun. As I have learned from first-hand experience, this is a quality that is rare in men's shoes. The boots are incredibly comfortable, with a soft and supportive interior, and can withstand the relentless abuse caused either by city streets or, as in my case, the local playground. They easily transition from day to night, going great with both jeans and khakis, and are easily paired with an oxford or plaid shirt. A word of warning though. As the name implies, these boots were inspired by those used in desert combat; meaning they were, and continue to be, designed to tackle sand. As such, if you wear these on a snowy/sleety/rainy typical Northeast wintry day, they will quickly turn into the most stylish pair of skis ever used on a metropolitan sidewalk. Be careful. Overall though, I love these boots and would suggest that any similarly style-conscious dad go and try on a pair for himself. I remember in my high school years rocking my black wally's and my powder blue wally's- they truly were the most comfortable shoes I've ever worn- and I made quite the statement at that. Good choice. I own 2 pairs of desert boots myself actually. Nice review.